As he entered his homestead, his two dogs ran to welcome him. It was midday and the sun overhead played its usual game upon the men and women tending to their farms. A few women would periodically leave the fields and sit below a mango tree, where they would quaff several cups of water to cool their thirsty lungs. His wife emerged from the smoke-filled thatched hut, tightening her leso as she hurried towards him. Sungu lowered his eyes to the ground. As he advanced toward the kitchen hut, he lost control and fell over a pile of firewood. Promptly, his wife pulled the piece of firewood lying beside the kitchen entrance, rubbed her eyes repeatedly, and made to break the wood on her knee. It broke with a loud snap. Sungu did not flinch. Instead, he picked himself up, and retreated into a deep silence, his head drooping, his arms motionless. “How did it go? Did you agree to sell the land?” she asked again. Sungu cast her a harsh glance. “Is there anything I can eat nyako?” he said. “You think?” He made as if to pounce on her, but she sneaked back into the kitchen right on time. “It is the issue to do with the land. It is eating you up. Admit it,” she said, emerging from the kitchen and placing the jug of porridge on the veranda. Sungu paused, turned to the porridge and poured it slowly in a large metallic cup. He sipped it, but not before pouring a little on the ground. “Give me a break, woman. Just give me time,” he said. He needed ample time to think wisely. To break down the matter into smaller pieces and consider each piece on its own. He continued to stare at the endless horizon and the wreaths of white clouds resting just slightly above it. Sungu got so carried away that he did not notice his five children arrive home from school. They fell upon him and mobbed him with requests. That afternoon, he decided to pay his childhood friend a visit. The matter had reached that moment where suicide was beckoning him, nudging him, teasing him. He needed to talk to his friend. At around half past two, Sungu took his Phoenix bicycle from his hut and cycled two miles to his friend’s village. Usually at this time, only a few villagers could be seen along the footpaths; boys grazing livestock in defiance of the sun; girls fetching firewood, and another group on indescribable errands – a consequence of the village grind and ceaseless monotony. On arrival, Sungu dismounted from the bicycle and pushed it beside him as he entered the homestead. He leaned it against an Umbrella tree in front of the big house. The faint sound of a moving object outside aroused Odolo from his dreamy siesta and he rose to his feet and made for the door. “Welcome, Sungu,” Odolo said and offered a hand. He patted Odolo on the back before settling for a wooden chair near a clay-pot. Sungu’s face turned pale as he choked on his last words, and his usually distended cheeks deflated like a pin-pricked balloon. Odolo shot sympathetic glances at his friend. “So are you trying to hint that I should sell the land?” asked Sungu, pretending to be surprised. “Very true. But the main reason is because of his education. He saw the light early, Sungu.” A small pause. An unsettling silence fell upon them, like that moment between the confirmation of the death of a loved one and the first wail. Sungu did not erupt into a wail. A man does not wail. “What do you say?” Odolo asked. The conversation diverted to the mundane village issues – the many funerals of friends being swept into their early graves by the ‘Special One’ – the harsh weather threatening to wilt their crops – the coming general elections. It was always coming – would it be another crazy apocalypse? Only those in the city could tell. And the dropping market prices of livestock. Both Sungu and Odolo knew things were deteriorating, but one did not admit failure even in the face of overwhelming adversity. Life was constant endurance and survival. Before five o’clock, Sungu bid his friend goodbye and cycled back to his village. As he cycled, he tried to digest Odolo’s words: “…this is now sacrifice. Education or land. It is for you to choose.” Which was which? How did one choose between education and land? With education, one could find a career and buy land. Still, one could sell land and use the money to fund his education. He recalled Tange’s school performance. In the first-term, he was third last, second-term; last. And in the just concluded mock exam; again, last – this time tailing the whole form four class. Sungu suffocated with so much disgust that he nearly lost his balance, but acted swiftly and spared himself the disgrace of falling. Here he was, overburdened with school fees, his head almost splitting into two because of chronic stress, and Tange was not even studying hard. The wife forever nagging. Money for food. Money for the children’s clothes. Money for business. A business that he had not seen record even a single cent in profit. Every time, it was always money for something. And now there was a fork in the road. Was he to sell the land or not? Sungu reached home after the sun had gone to rest. He talked to nobody and so nobody tried to talk to him that night. Neither did he eat anybody’s food. After a cold bath, he fished out a crumpled hundred shilling note, placed it on the table as he usually did whenever he had something then collapsed into the bed. He was human too and would explain to his wife and children that he was at a crossroads. For those in primary school, like Odolo likes to say, their head teacher can go to hell! After all, primary school was now free. He could take his children to another school. Apart from the nagger who was now expecting his ninth baby, the most critical case was that of the boy. The following morning together with his son, Tange, they cycled to Hekima High School to once again plead with Mr. Takamani – the principal. Sungu had borrowed one thousand shillings to save face and, demonstrate his seriousness about the boy’s education. “No, Mr. Sungu. We don’t operate a secondary school like some public toilet where you come with baseless suggestions.” For effect, Mr. Takamani rose to full height. He was a burly figure – six feet tall in thick horn-rimmed glasses adorning a black and white stripped cotton shirt matched with a pair of dress trouser that made him resemble a wrestling referee. “But mwalimu…” Sungu tried to cut in. “Mwalimu, I am stuck, please help me.” Sungu once again dipped his fingers in the back pocket of his patched SAVCO jeans, tears almost welling down his dejected face but it was too late. Heart-broken and his spirits crushed, Sungu wiped his sweaty face, cast an evil look at the principal now leafing through a newspaper before opening the door into the sun-filled morning, and walked out, son in tow. Sungu decided it was time to speak up. His wife was in the farm when he got home. After entering the main house, he called Tange. The boy sprinted out of the room into the compound and out of the homestead. Fifteen minutes later, his wife arrived eager to finally discuss with her husband the matter at hand. During her girlhood, her mother had advised her on the importance of dialogue. Whenever there is an issue, always seek out your husband and find out what the matter is. It not only reduces tension in the marriage, but also shows him how much you care. 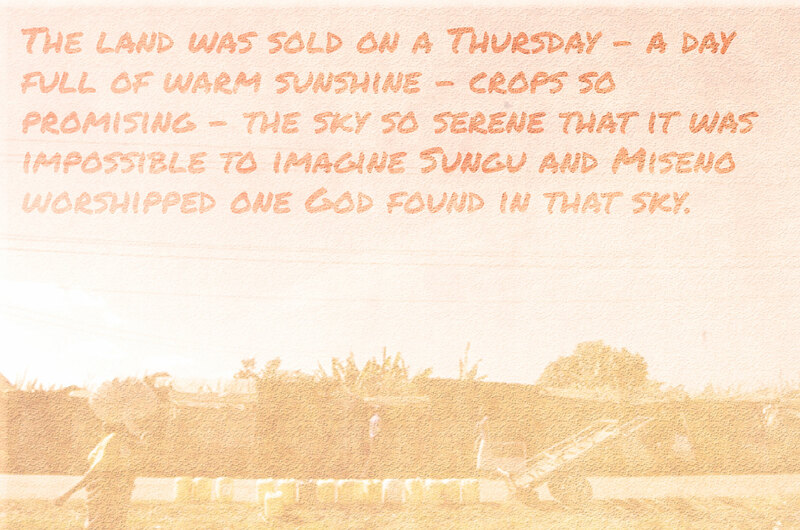 The land was sold on a Thursday – a day full of warm sunshine – crops so promising – the sky so serene that it was impossible to imagine Sungu and Miseno worshipped one God found in that sky. All the concerned parties convened at the chief’s camp. Sungu was accompanied by two elders, his friend, Odolo, and his wife. On the chief’s side were two lawyers and a surveyor; a son of Miseno’s clan. Inside the chief’s office, Miseno’s lawyers did not allow the elders to enjoy the spectacle of introducing themselves. Instead, from a brown leather briefcase, one lawyer produced a sheaf of yellow papers and tossed them before Sungu. “How do we sign what we have not read?” Sungu’s wife protested. Miseno and the surveyor agreed it was a formality for the selling party to at least read the terms and conditions. “But does it matter? Read or not read, you will sell the land,” the other lawyer said and matched out of the office. His wife asked for a pen and in front of the two elders, his wife, and friend; Sungu signed the papers before handing the title deed to Miseno. “Where is the money you crook?” Odolo said. “Bring these nobodys their money,” Miseno said. Money was brought in a gunny sack and counted. “It is not enough! This is not the exact amount we agreed on,” Sungu yelled in alarm while letting the gunny sack fall to the ground. Sungu picked up the gunny sack and together with his vanquished party; filed out of chief’s office in a solemn silence. Before they reached the gate, Odolo broke the silence. “Something must be done. We will have to do something about this man. ” The speaker waited for another voice to lend support. Only that none came as they kept on walking. Amol Awuor (@awuor_89) is a B.Ed. student majoring in English and Literature at Kenyatta University, a blogger, and a commentator on topical issues such as education, politics, language, and literature. His journalism has been published in the Saturday Nation. He also writes book reviews in The Star newspaper. In the near future, he wants to be a prolific journalist and a literary scholar. In his free time, he watches a lot of military movies, and supports Gor Mahia FC. This entry was posted in Jalada 04: The Language Issue. Bookmark the permalink.